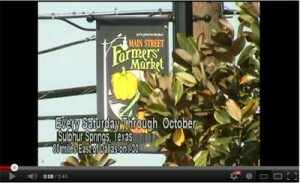 The Sulphur Springs Farmers Market offers a unique shopping experience in the revitalized downtown area in eastern Texas. Not only can you purchase local produce straight from growers, but you can also do so while listening to live music on a Saturday night. Fresh strawberries, watermelons, pumpkins, tomatoes, cucumbers, and peaches are ripe in season and area farmers are quick to show off their favorite picks of the week. The market, as it’s known to locals, serves as a gathering point for the community. With strong support from their regular customers, the Sulphur Springs Farmers Market won the American Farmland Trust’s 2012 America’s Favorite Farmers Market contest in the midsize category. “We are all very excited about the award,” said Shane Shepard, Community Development Director, City of Sulphur Springs. “We felt we would be a winning contender.” But the award verified their hard work and dedication. Located about an hour east of Dallas, the rural area is peppered with markets. Local farmers often have to pick where to sell their fruits, vegetables, and meats. Organizers at Sulphur Springs saw the opportunity of hosting a market Saturdays from 6 to 10 p.m. as a way to allow vendors to sell at two markets in one day. With live music playing during the warm Texas evenings, it’s not uncommon for the hours to extend into midnight. About four years ago the city started a revitalization project in the downtown district. It was modeled on new urbanism, with narrower streets, and more walking areas. Part of the project was to create shopping neighborhoods full of foot traffic. A downtown farmers market fit perfectly into the new design. In the first three years, the market was growers only and served as a way to bring fresh food to community members. There are several big agriculture producers in the area, but not as many small farmers. This led the market to shift away from a strict growers-only focus, though this move has indirectly helped the farmers who sell their produce because customers that came for prepared food or artwork also purchase fruits and vegetables. This entry was posted in farmers markets, Local Farms and Food, Texas and tagged evening market, Farmers Market, local food, music, Sulphur Springs on October 18, 2012 by admin.